Whether you settle in at the bar, sit outdoors on the patio or take a table in our Corolla NC restaurant and tequila bar, you’ll find plenty of delicious options to satisfy your thirst and appetite for contemporary Mexican cuisine. On our Bar Menu you’ll have your choice from an extraordinary variety of tequilas, margaritas, sangrias, cocktails, beers and wines. If you’re looking for modern Mexican food in Corolla NC you’ll find it here. 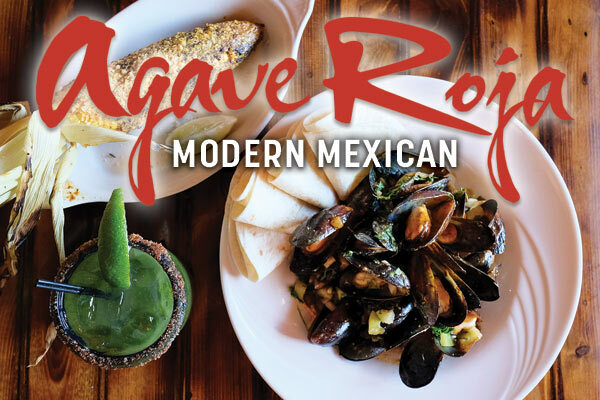 The Agave Roja menu begins with homemade guacamole, tamales, adobo-marinated pork ribs, queso and more. Move on to fresh salads, ceviche, seafood specialties, housemade enchiladas, entrees and sides. If you’re looking for Outer Banks seafood, you’ll find it here, infused with the vibrant spices and flavors of Latino cooking. Our house specialties, see Great Plates, include steaks, chicken, shrimp, fish and ribs. Maybe the most popular menu item is our Camarones Aztecas, a Volcanic bowl of bubbly, spicy tomato broth with shrimp and mussels. Lunch is casual, while dinner brings in a higher caliber of entrees. See Daily Specials. Pork Shank - tender braised pork shank in tomatillo chile sauce served over charro beans with zucchini-corn cream. Seafood - crab and shrimp, spinach and avocado salsa, crema Mexicana, mango-habanero salsa, flour tortilla. The authentic Mezcal with the worm in the bottle. Pungent spice, wood and mineral aromas. A rounded, supple attack leads to a smooth, medium-bodied and an exotically peppery finish.